In particular, a number of representatives of large American companies have been getting acquainted with the conditions of the Armenian economy as part of the efforts to encourage U.S. investments in Armenia. On Wednesday, they took part in a one-day conference organized for that purpose by the Armenian government and the U.S. Embassy in Yerevan. 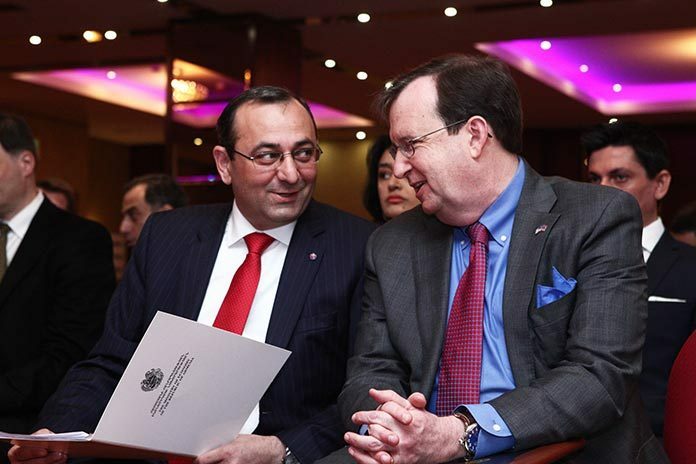 “I am sure that this new stage of development of Armenian-American relations will promote closer and more effective cooperation between the Armenian and American business communities,” Armenia’s Economy Minister Artsvik Minasyan said during the event. The minister suggested that American businessmen make investments in such areas of Armenia’s economy as information technologies, agriculture, civil aviation and others. The United States is the sixth largest trade partner of Armenia. The largest U.S. private business investment in Armenia, estimated at $250 million, was finalized last year when ContourGlobal purchased the Vorotan Hydro Cascade in the south of the country. The deal was not followed by other large private investments from the United States, however. U.S. Ambassador to Armenia Richard Mills said that one of his primary goals was to develop economic relations between the two countries. He said that the American side hoped that by means of creating links between Armenian entrepreneurs and a number of well-known American companies it would become possible to see further expansion of bilateral trade. Mills said that U.S. companies with experience of doing business in the former Soviet countries had been invited to attend the forum in Yerevan. These companies, he said, are engaged in consumer goods, engineering and information technology sectors. The U.S. diplomat also attached importance to fighting corruption, which he said would create a level-playing field for businesses in Armenia. Economy Minister Minasyan in this regard highlighted the initiative launched by Prime Minister Hovik Abrahamyan to fight against corruption and monopolies as an opportunity to improve the investment climate in Armenia.